Who is eligible to receive an Alpha Delta Pi Foundation Scholarship? 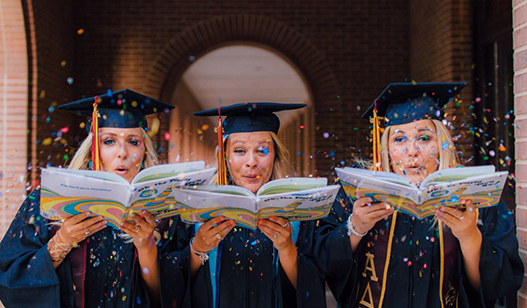 Scholarships are available to initiated members, in good standing, of Alpha Delta Pi. We currently offer undergraduate, graduate, and continuing education scholarships. New (Alpha) members are encouraged to apply, but must be initiated members in order to accept the award. Is there a minimum GPA requirement? Yes. Unless otherwise noted, we require a minimum 3.2 cumulative GPA. For the last three years, more than $100,000 in scholarships has been awarded. We have several new scholarship funds available for our 2019-2020 academic year, so we expect to give out even more awards with scholarships ranging from $750-$3,000. Can someone receive more than one award? Depending on the applicant’s qualifications and scholarship criteria, she may receive more than one scholarship in a given year. Will all applicants receive an award? Due to limited funding, we are unable to award a scholarship to every deserving applicant. We always have more applicants than funding available so the scholarship process is competitive with a 1 in 5 award rate. Each year brings a different pool of candidates and qualifications, so we encourage applicants to apply for scholarships each and every year they are in school! Can I use this scholarship for room and board or my ADPi membership dues? Scholarships can only be used for tuition, books and fees. As a 501(c)(3) educational foundation, unfortunately scholarships cannot be used for dues or room and board. Scholarship awards will be sent directly to the school and can only be applied towards academic expenses. I qualify for multiple ADPi scholarships. Do I need to submit more than one application? No. The great part about our scholarship application process is that you only need to submit one complete application. You are automatically eligible for any scholarship for which you qualify. How are scholarships awarded? What is the criteria used for selection? A panel of higher education professionals make up our scholarship selection committee. These volunteers will read, score, and recommend all scholarship recipients. They use a combination of factors including academic excellence, participation and leadership in Alpha Delta Pi, campus activities, community involvement, awards and honors, employment or other significant commitments, and financial need (if applicable). An important criterion for selection is the essay. The committee is looking for a creative and thoughtful response to the prompts provided in a clear and concise format (500 words or less). I have previously received a scholarship from the Alpha Delta Pi Foundation. Can I apply again? Yes! We encourage our members to apply for scholarships every year they will be in school. Please note, every year the pool of applicants is different. Receiving a scholarship one year does not guarantee you will receive an award another year. Yes, several of our scholarships have financial need as a qualifying factor. Please make sure you fill out the Financial Need section of the application if you believe you qualify. I am currently an undergraduate but plan to go to graduate school next year, what application should I fill out? We base the awards on the upcoming academic year, so you would fill out the graduate application. Can I apply for a graduate scholarship if I do not know what school I’m going to attend? Yes! Please let us know what programs you have applied to and submit at least one letter of acceptance for a graduate program by the time the application closes on March 1. We understand many schools provide acceptance materials following the March 1st deadline. I have completed one Bachelor’s degree, but I’m in the process of receiving another through a post-baccalaureate accelerated program. Which application should I fill out? Since you have already received one degree, we ask that you complete a Continuing Education application. I’m in an extended professional program for school (i.e. 5-6 year programs that award dual degrees such as BA/MA or offer extended tracks) and am not sure which program to apply for. Can you clarify? Even if you are still an active member of the chapter, if there is the incorporation of any graduate level or professional certification material, then you must apply for the graduate scholarship. If you are unsure or still have questions, please email foundation@alphadeltapi.com. The application deadline is March 1, 2019 at 11:59PM Eastern Standard Time. Your recommendations are also due on March 1, 2019 at 11:59PM Eastern Standard Time. Will my scholarship application be considered if my references do not submit their recommendations by the application deadline? In order for your application to be considered, it must include complete recommendations from all your required references. As the applicant, you are responsible for verifying that your references have submitted completed recommendation forms. The deadline for your recommendations is March 1, 2019 at 11:59PM Eastern Standard Time. Will the Alpha Delta Pi Foundation accept late materials? The Alpha Delta Pi Foundation will not accept late submissions or materials for any reason. These include, but are not limited to: letters of recommendation, transcripts, or the application. What happens if my computer crashes while I’m working on my application? We strongly encourage you to apply as early as possible as this application does require thoughtful responses and letters of recommendation from multiple people. Because this application is open and available for several months, we will not accept late submissions even in the event of a technology glitch. To protect your application from being lost, continue to save all your responses as you complete the online form. The application only saves information saved by the applicant, so save often. SmarterSelect is a third-party application system to help manage the scholarship process. All applications and recommendation letters must be submitted via SmarterSelect. Applicants should create one SmarterSelect account to manage their application. It is not necessary to create more than one application or profile. If you have already created an account, please click the application link on the ADPi Foundation Scholarship page and sign in to your account. Do I need to complete my application in one session? No. You do not have to complete your application in one session. You may save the information you have entered on the form, log out of SmarterSelect, and return at a later date to revise or complete your application. Just make sure you save along the way and SUBMIT your application before the March 1st deadline. Do I need to submit transcripts? We will ask you to upload an unofficial or official copy of your transcript to SmarterSelect. A copy of your transcript from every college or university you have attended must be submitted. Again, for the application, it can be an unofficial copy. If you receive an award, we will require an official copy of your transcript be submitted before the scholarship distribution can be made to your college or university. How do I upload my transcript? Remember, if you receive an award, we will require an official copy of your transcript be submitted, but for the application process, an unofficial transcript is sufficient. How many reference letters do I need? Who can write the letters? ***If the applicant has been out of school for 2 or more years, you may replace the two (2) letters from professors with letters from a supervisor or primary employer. Please note, letters from Greek Life advisors, deans, guidance counselors, or administrators who have not instructed the applicant in a classroom setting will not be considered. Do I need a letter from an Alpha Delta Pi women? This year, we will have a form for your Alpha Delta Pi recommender to fill out. At the end of the form, they will be asked to attach a letter of recommendation. Your letter should come from a chapter advisor, board member of your local alumnae association, house corporation officer, or an Alpha Delta Pi international officer. One (1) form will need to be completed for each undergraduate, graduate, and continuing education applications. Can my academic advisor write a letter on my behalf? No. Academic recommendation letters must be from those individuals who know you in a classroom setting – who have had you in class and can give insight into your academic performance. This is why we ask the letters to be from a professor you have had in one of your classes that is under your major or minor field of study. How do I know if my references have been submitted their recommendation forms? After each of your references submits a complete recommendation form, you will receive an email from SmarterSelect confirming their submission. You can also view the status of your reference’s recommendation forms at the top of each Reference section noted in the application. My reference did not receive the link to the recommendation form. Can they email you a letter? No. All reference letters must be submitted on SmarterSelect prior to the deadline. Please see the REFERENCES page of the application for information about monitoring the status of recommendation forms, resending or canceling requests as needed. My reference says he/she has submitted the recommendation form, but I have not received a confirmation email. What should I do? Please ask the reference to confirm they clicked SUBMIT on the form. They will need to answer a few questions and upload your letter, so it’s possible they did everything except clicking the button to SUBMIT. Once they successfully submit your reference, there will be an on-screen confirmation message, and you will receive an automated email. Your application will remain in the “pending” status until all letters are successfully submitted. Please note, due to the significant volume of applications we receive it is your responsibility to follow up with those you have asked to write your references. No late submissions will be considered. When will I be notified if I have received a scholarship? You will receive a notification via email in early June. Notifications will be sent to your primary email, included on your application, if you have received an award or not. Please add foundation@alphadeltapi.com to your address book to prevent this email from being marked as junk/spam. What if someone cannot accept their award? In the event any initially-selected recipient can no longer accept an award or fails to submit their acceptance materials on time, an alternate recipient will be selected from the pool of qualified applicants. Alternate recipients will be notified via email. If I receive a scholarship, when will I receive the award? A scholarship acceptance packet will be mailed or emailed, based on the recipient’s preference, during the summer months. Pending all materials have been accepted, checks will be mailed directly to the college or university between August 15 – 30, 2019.